Linda is a blogger, coffee-lover, and creative entrepreneur who is constantly inspired by the world around her. When done right, DIY weddings can offer guests the opportunity to see you and your partner's creative sides shine through in fun and creative ways. However, planning a DIY celebration takes a lot of time, effort, and organization, so you want to be sure that you are being smart about which projects to tackle yourselves and which are best left to the professionals. Let's take a look at what wedding pros themselves agree are projects you can and projects you shouldn't DIY for your wedding. There can be a surprising amount of stationery in weddings. From save-the-dates and invitations, to menus and ceremony programs, it's a lot of paper and, while having a professional calligrapher or artist handle them for you can certainly yield impressive results, it can also be very costly. Nowadays, there are online programs that couples can use to create their own stationery suite that are both pretty and budget-friendly. "Several sites offer beautiful printed pieces, and I have seen many couples create lovely programs, menus, and even invitations from their templates," says Ann Oleinik of Ann & Kam Photography. More and more, couples want to personalize their reception tables to show off their personality as well as serve as ice breakers for guests to get to know one another. "Centerpieces are such a prominent focal point for the wedding and one of the best ways to capture the day's theme into the celebration," encourages Audrey Isaac of 100Candles.com. "By using personal mementos in lieu of floral arrangements, like favorite books or framed family photos, and pairing them with beautiful lighting like votive candles and ornate candelabras, it's simple to design a centerpiece that is uniquely 'you.'" Anything in the category "can be done way early"
Smaller projects you can plan for well ahead of time can also be a great way to show off some of your creativity. "Favors can be an easy one if it's just about the packaging and that can be done ahead of time," suggests Jamie Chang, owner of Passport to Joy, a step-by-step program that guides couples in planning their own destination wedding. "Details like guest books, signs, and small decor are also typically pretty manageable as well." No matter which DIY projects you choose to take on, it is important to be sure you are doing them early- it will save you from headaches down the road. "Getting your projects organized as early as possible in the planning process is the key to your success," urges Joanne Jiang of LadyMarry, an online and mobile app that guides engaged couples through the wedding planning process. "Find an app or program, such as LadyMarry, that can keep you organized from the onset. With every project you complete, it is stress taken right off your shoulders, so plan early and follow your schedule." Luckily, it has never been easier to DIY your organization methods. There are several apps and tools available that allow you to keep track of to-do's, as well as create your own timeline. When deciding which projects to bring in a professional and which to do yourself, photography should always land in the professional pile. 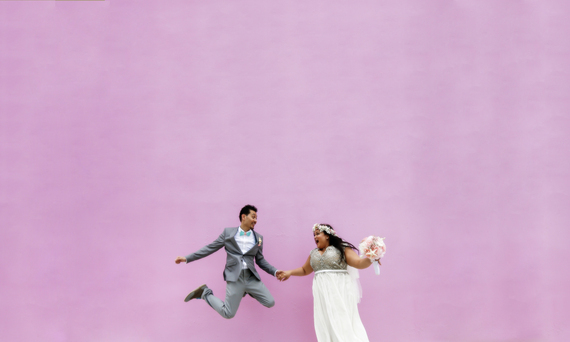 Kaysha van der Heyden, owner of Kaysha Weiner Photographer explains, "When incorporating DIY elements into your wedding, I believe photography should never be considered an option. When it's all said and done, the pictures from your wedding may be the only things you have to look back on. Do you really want the stress and pressure of doing it yourself?" As written earlier, smaller décor pieces are great to focus on and very DIY friendly. However, when it comes to the large scale design elements like drapery and lighting, it's a god idea to let the pros step in. "Big design elements are generally best left to the professionals," explains Fabrice Orlando, owner of Cocoon Events Management Group. "They have a better understanding of the intricacies and how all of the elements best come together." When it's down to the wire before your wedding, there are several projects that need to get done. From finalizing bouquets to the set-up of your ceremony and reception (décor, tables, chairs, linens, etc. ), the last thing you should be doing is worrying about it. "Any to-do's that have to be done within 48 hours of your wedding, hire someone to do it," says Jennifer Taylor, owner of Taylor'd Events Group. "It won't be enjoyable for you or your loved ones to try and handle it when everyone should be soaking in the moments." Remember to play to your strengths when deciding which projects to do yourself, and have fun with it. For projects that seem above your skill level, bring in the pros to ensure you get exactly what you want for your big day.